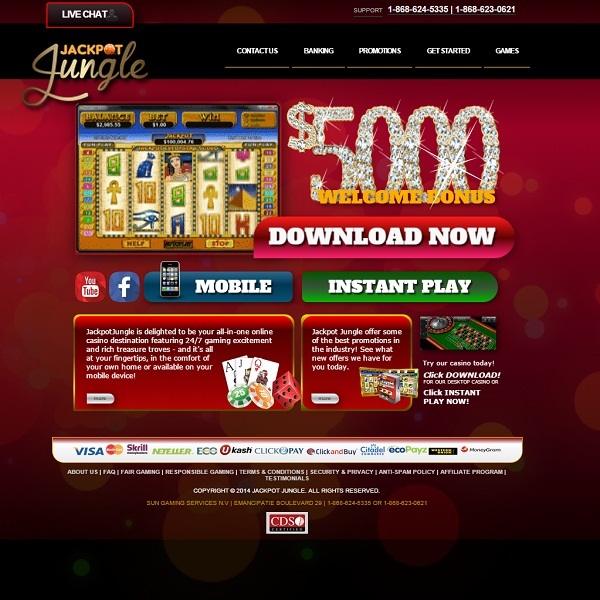 If you are hoping to win a really big jackpot then it might be worth taking a look at the new Jackpot Jungle casino where there are so many jackpots on offer that you could quite easily get lost. The casino offers slots games from Realtime Gaming and there is a fantastic collection on offer. Members will find a huge range of slots, such as Goblins’ Treasure and Lucky Tiger, and of course they all offer substantial jackpots. Those that enjoy card and table games won’t be disappointed either as there is blackjack, roulette, baccarat, craps, poker and more on offer. Best of all the games can be enjoyed in either instant play or download versions. All new members can enjoy a welcome package that is worth up to $5000. This comes in the form of seven deposit bonuses of either 200% or 100%. There are also daily bonuses, special promotions and much more.